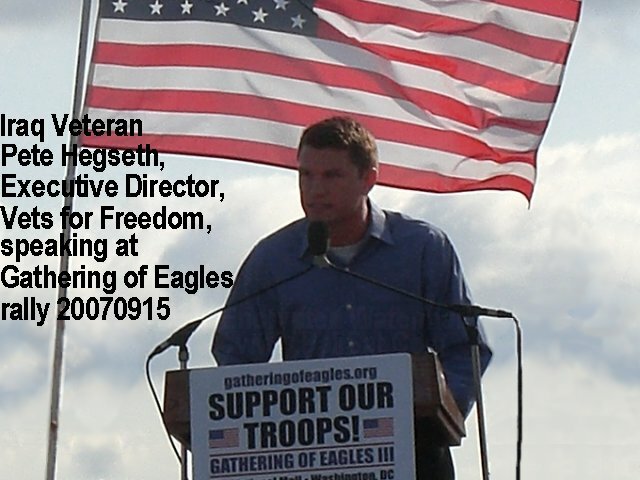 WEBCommentary(tm) - Iraq Veteran Pete Hegseth Exposes Defeat of Defeatists and their State of Denial about Success of the Surge Designed by Petraeus, Ordered by Bush and Implemented by Our Troops. Iraq Veteran Pete Hegseth Exposes Defeat of Defeatists and their State of Denial about Success of the Surge Designed by Petraeus, Ordered by Bush and Implemented by Our Troops. Iraq war veteran Pete Hegseth devastatingly exposes the defeat of the defeatists as well as their state of denial about the success of the surge designed by General David Petraeus, ordered by President Bush and implemented courageously and effectively by our troops. Editor at WrennCom.Com and PoliSat.Com. I've met this man and spoken with him at length.� He's quite impressive and knows of what he speaks.� Not only has he courageously served our country in Iraq, but he also showed political courage in accepting the role of leadership of Vets for Freedom.� Recognizing the extent to which American voters have developed such short attention spans, he understood the need for those of us who know our success in Iraq to be a vital step in what will be the long, arduous task of assuring the triumph of liberty over tyranny for the benefit of our posterity to continuously counter the philosophy of defeatism that otherwise will continually take hold (as it did in November, 2006).� When Hegseth's country needed him in Iraq, he was there.� When his country needed him in the "Battle of D.C." over the future of our Iraq strategy in particular and our strategy against fanatical, medieval tyranny generally, he was there combating the defeatist propaganda being spewed by political hate groups such as Code Pink, DailyKos, MoveOn.Org, ANSWER, 9-11 "Truthers," Gorists,� etc. ad naseum., who have earned the title "Axis of Sleazel." 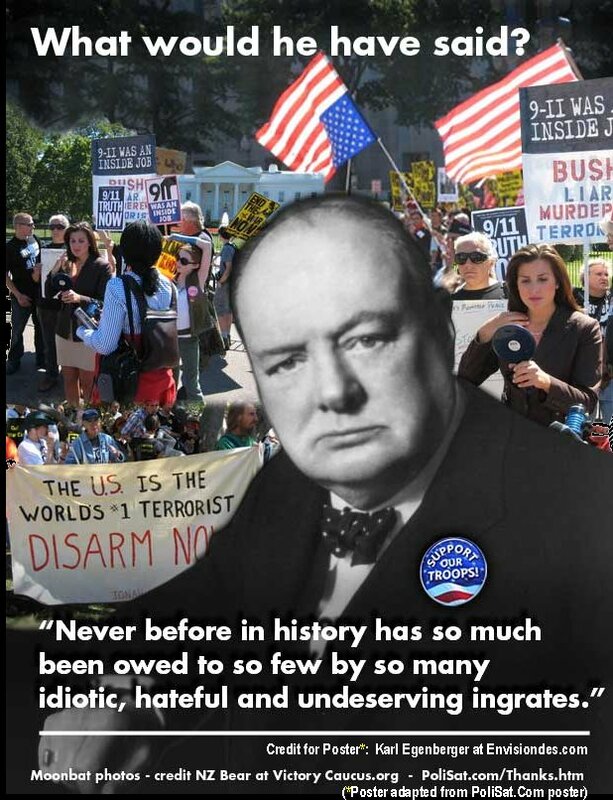 Never again can we afford to make the mistake that many of us made in interpreting the results of Election 2004 as evidence that the American voter "got it. "� Such insights pass quickly from the minds of American voters.� To paraphrase Jefferson, "The tree of liberty must be periodically nurtured by torrents of knowledge to combat the withering infestation of defeatism." Given what appeared to be an ascendancy of American Self-Defeatism little more than a year ago in the wake of the November, 2006, elections, not only do his comments devastatingly expose the politically-self-serving delusions American Self-Defeatists" but they also exude a justified sense of satisfaction warranting a paraphrasing of one of Winston Churchill's famous lines:� "There's no greater exhilaration that being politically shot-at and missed. "� However, given what we know about the political attention-span of too many of today's Americans, this exhilaration will prove temporary unless we remember that we must unrelentingly educate the public and unrelentingly battle the propaganda of defeatism. Another aspect of the process in which the American public re-awakened (in 2007) to the dangers and reality of the struggle we face and not only the catastrophic consequences of defeat but also the immeasurable benefit of victory in the ultimate triumph of liberty over tyranny for our posterity is the country's apparent re-embrace of what had been the World War II generations intuitive understanding of the correct "end-game" strategy in warfare. About this song/video-- Go here. Is my commentary above "over the top" patriotism?� If so, it's not a tiny fraction as "over the top" as the real-world courage, sacrifice and determination being exhibited in our behalf by our troops.� Such "over the top" patriotism is far superior to the "below the bottom," neo-nihilistic philosophy of the American Self-Defeatists.